This herbal extract is rich in polyunsaturates and it is thought to be the herb to have in the cabinet for maintaining good heart health, because of its ability to reduce cholesterol levels in the blood. It is also used to cleanse the blood and improve circulation, as well as, alleviate the painful, stiff joints of arthritis and gout. It has been very beneficial for digestion and for improving the appetite. And has also been used for relief and treatment of stomach ulcers. Safflower has become well-known for helping to lower cholesterol levels and for maintaining good heart health and preventing heart disease, heart attacks, and strokes. Also known to improve circulation, it has been used to treat and reverse a condition with congested and stagnant blood, or poor blood circulation. Safflower invigorates the blood has been used to reduce blood clots and ease pains in the lower abdominal area and promotes menstrual blood flow. Used as a laxative, it is thought to be an effective bowel cleanser that also improves colon function. As a diaphoretic, Safflower has been used for centuries to induce perspiration and helps to diminish fevers and cool the body. It is also considered an effective diuretic and cleanses the bladder. Safflower is believed to be very helpful in treating, gout and the painful, stiff joints of arthritis, as well. Besides eliminating uric acid deposits from the system, it has also become part of some sports formulas to help reduce lactic acid build-up in after strenuous exercise. This herbal extract is believed to improve liver function, and so it is helpful in treating jaundice and liver ailments. 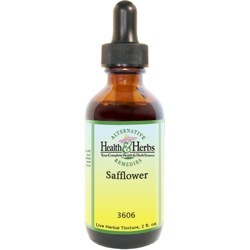 Safflower is helpful and soothing for cases of heartburn, gas, diverticulitis, and ulcers. Safflower has been used to remove phlegm from the respiratory system and clear the lungs and believed to be useful for relieving symptoms of phthisis or pulmonary tuberculosis. Also good for colds and flu, it has a warming effect that and often wards them off. It has also been thought to have a calming effect and has been used for hysteria and panic attacks. Ingredients: Safflower, Structured Water, 20% Alcohol. Non-Alcohol: Safflower, Structured Water, Vegetable Glycerin. Contraindications: Pregnant women should not use Safflower.